The Water’s Edge Show was a blast! We sold out yet another show—this time at the Water’s Edge Resort in Westbrook, CT. We also got some great fan feedback! Our band was so enjoyed by these new friends, that everyone stayed till the end! Well, we hate to say it, but we are not surprised. The music we play is so fantastic, and we all love it so much, that something magical happens to us when we get together on that stage. Booking: Anthony Manzi / President, Music Tribute Productions Inc.
Fri. July 19 Bartlem Park, Cheshire Park & Recreation-We’re Back by Popular Demand! What they’re saying about Running On Empty Band. “Listening to Running On Empty is one wonderful experience! Hearing those great Jackson Browne songs coming off that stage is a thrill. The band delivers with high energy and great musicianship. If you close your eyes you feel like you’re in Laurel Canyon and it’s 1977 all over again! 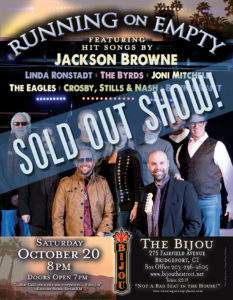 We played another Sold Out show on Saturday, October 20th, at The Bijou Theater in Bridgeport, CT, where there is “Not a Bad Seat in the House!” We had a great time! Thanks to you. On August 24th, We had a great time playing for you at Infinity Music Hall & Bistro in Norfolk, CT. Thanks again for being there! Violin player Kenny Kosek at Infinity Hall with Running On Empty. The Kate Theater show in Old Saybrook, CT. on June 2nd, 2018 was a Sold Out show with 249 tickets sold! Thanks so much for your support. Running on Empty Band had a great, near sell-out show at the Nelson Hall Theater in Cheshire, CT, November 17th, 2017 with 225 seats sold. It was a solid turnout on a Friday for a theatre that few folks know about! Toad’s Place of New Haven, CT, with Mark Daniel opening the show. Thanks to everyone for coming! 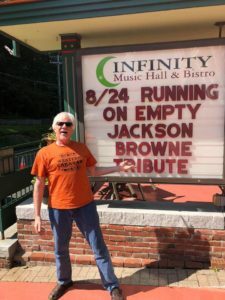 While running up 91 on a beautiful, New England blue-sky day in the summer of ‘15, Jackson Browne’s song, “Running on Empty” was blasting from the car stereo. At that moment, creator, bandleader, manager Jonathan “Rock Doc” Schneider knew he had to assemble a group of talented singers and musicians to re-create the music from that special time and place: The early 70’s in Laurel Canyon. 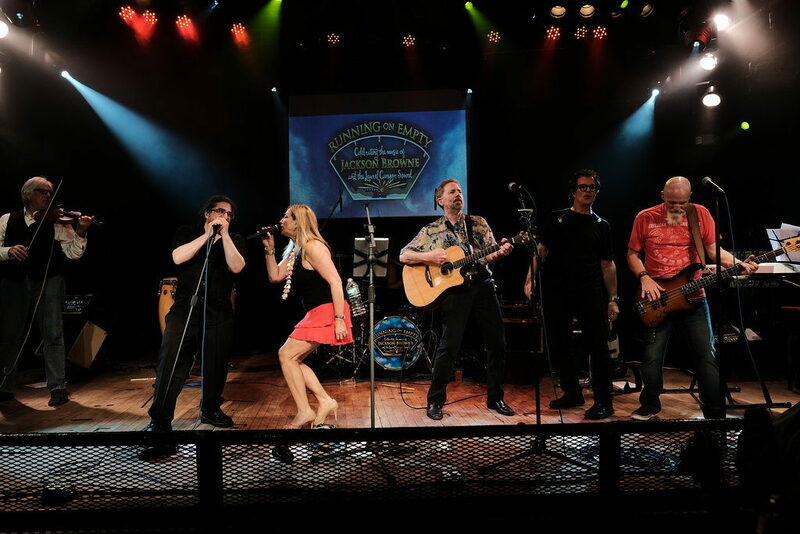 The songs of Jackson Browne, Bonnie Raitt, Linda Ronstadt, Joni Mitchell and the Eagles come to life with the extremely talented ensemble that always leaves the audience on their feet dancing, and wanting more. Please sign up for our mailing list. Go to our Contact Us page. Like us on Facebook!